Today, for the first time in far too many weeks, I simply couldn't find anything to write about. It's not that I haven't got at least a dozen unfinished drafts waiting for my attention including various horror movie reviews, something about one of my favourite horror authors, and a top ten of "the sickest films ever", but I just couldn't get into it. Last night, I stayed up late watching "Spellbinder" (1988) which I discovered deep in the bowels of the Neflix horror section, but no matter how many times I tried to review it, all I kept wanting to write about was Kelly Preston's norks, so I gave up. So tpday, like all good procrastinators, I decided to fiddle with my blog layout some more. Usually when I do this, I end up breaking something and driving myself mad putting it all back the way it was, but these were only subtle changes this time. I changed the font size on the gadget sidebars, made the tab text bold, hid the annoying empty box on the right hand column which was added by Disqus, added a links box for some old "celebrity" interviews which nobody has ever read, and then became a total sellout by adding a few affiliate links. Yes, I finally decided to do some monetising just to see what was out there. 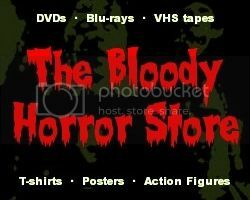 I already had a CafePress store which I've only ever sold one thing from and an Amazon "aStore" which is equally as pointless, so I decided to get myself a new AllPosters affiliate account and add some horror posters which nobody will ever buy either. It's fun playing with all the "link builder" pages on these sites, but honestly, people already know these big names already, and if they want something, they'll just go directly to the relevant website and search there. Monetising (or "monetizing" - the spell checker hates that word) a blog is, in my opinion, completely useless and often simply annoys readers who are sick to death of blatant advertising all over the internet already. Anyway, that's how I wasted yet another day. Now I'm trying to relax with an icy cold Monster (the dentist fixed my teeth on Wednesday for an enormous amount of money, by the way) while the world's smallest but loudest cat is demanding attention. In other news, Netflix have doubled their prices for anyone who wants to continue watching streaming videos and DVDs so I've cancelled the mailed DVDs part of their service. They don't have anything that I want to watch that badly on DVD now anyway, and there's always a plethora of "Megaoctocrap versus Shitasaurus" films to hate on my Roku box. Have the new Netflix prices angered you? I bet they have.